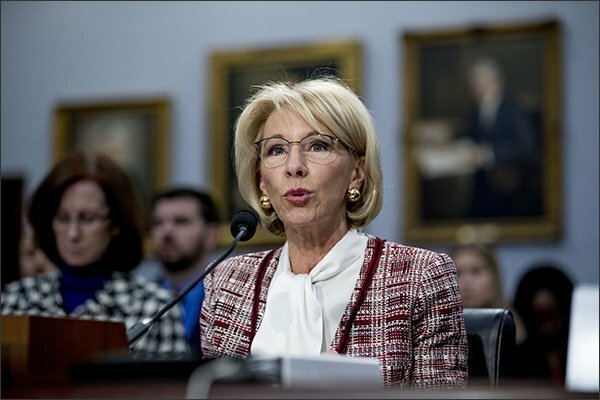 In her testimony before the House Education Appropriations Subcommittee on Tuesday, Betsy DeVos, the anti-public education Secretary of Education, was present to defend $7 billion in proposed cuts to her department. The cuts in the education budget are seen as measures to offset billions in lost revenue from tax breaks for the wealthy that have exploded the federal deficit. An examination of Trump’s FY2020 budget shows that the administration is asking to cut the Department of Education’s funding from $71 billion to $64 billion, eliminating 29 programs. In addition to zeroing out popular and proven programs like Special Olympics, which has garnered strong support during its 50-year existence, Pell Grants for higher education tuition assistance, literacy and after-school programs would also be adversely affected by new budget statements. Broadcast and print media were all over the story about a cabinet secretary who was as heartless as Genghis Kahn in laying waste to her department’s budget so that money could be freed up for other purposes. The one area that stood out the most was the elimination of $18 million in federal funds for Special Olympics and the added support the program provides for students with special needs. 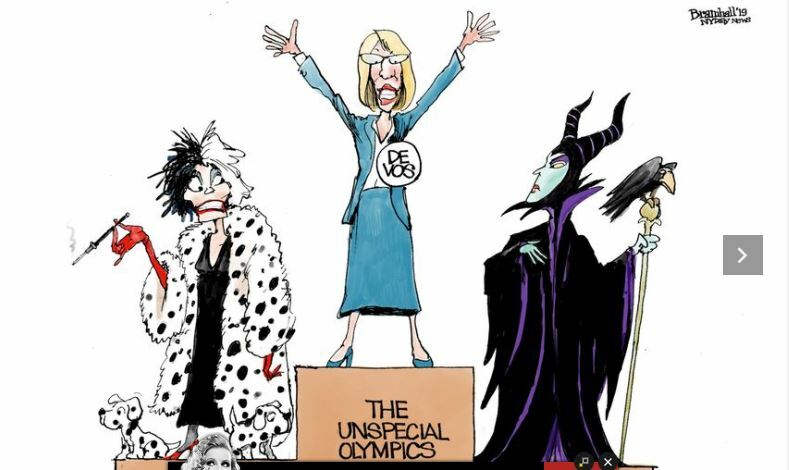 There was no shortage of adjectives to describe the evisceration of the Special Olympics funding. Cruel, mean, and heartless were the most common descriptors that were launched at DeVos & Co. in light of the new budget proposal. At one point in the hearing, Wisconsin Congressman Mark Pocan asked DeVos if she knew how many children would be affected by the elimination of the Special Olympics funding. As she deflected and finally said she did not have the answer, Poncan interjected. I’ll answer it for you, that’s OK, no problem. It’s 272,000 kids that are affected. As expected, her testimony generated no plaudits from a critical House oversight committee which is well aware of her manifest inadequacies. Members of Congress saw up close the same individual who was confirmed for her position in February 2017 by an historic 51-50 vote in the Senate, with Republican members Lisa Murkowski and Susan Collins voting against her. The confirmation vote followed her Senate hearing, where she displayed a total lack of knowledge regarding prevailing education policy and the mission of the department she was appointed to lead. DeVos joined the Trump team as a member of the wished-for Asterisk Hall of Fame, where a vote by the Vice President was needed for the first time in Senate history to break a tie and ensure her cabinet confirmation. Since her confirmation two years ago, DeVos has only added to her deserved reputation as being heartless, an anti-public education zealot, and devoid of policy knowledge. As a key member of the wrecking crew that is the Trump (mal)administration, we might as well throw in the term evil for good measure. When we look at a colossal cabinet of corrupt cutthroats and greedy, gouging grifters in a heartless, stupid, and, yes, evil government, Betsy DeVos fits in nicely. But a closer examination of her testimony also indicates that the Secretary, in addition to her aforementioned deficits, also happens to be clueless as well as tone-deaf. As the sole witness before the committee, she had to explain the breadth of the program cuts to Pell Grants, afterschool programs and, of course, the zeroing out of Special Olympics funds, the most shameless action of all. That theme was echoed in this exchange between DeVos and Education Subcommittee Chair Rosa DeLauro (D-Conn). We had to make some difficult decisions with this budget, DeVos told a House subcommittee. Madam Secretary, I have to say, and maybe it’s offensive: Shame on you. Yet one final detail needs to be recovered from the seeming wreckage inflicted on the United States Department of Education by its supposed CEO and advocate. At a time when Pell Grant funds are being cut, afterschool programs are threatened, and programs like Special Olympics were proposed for the chopping block, there is one area in the education budget that is untouchable in the Trump era. The Secretary’s propensity for cluelessness is seen in defending a budget that harms so many children with program cuts yet reserves a huge amount of public funds for charter schools, many of which are run by for-profit management companies. Her advocacy for increased funding for charter schools at a time when massive cuts are proposed for children with special needs is appalling, and when the Department of Education’s own inspector general examined the efficacy of the Charter Schools Program for state education agencies, where federal start-up grant funds are available to establish new charter schools. DeLauro spent much of her time highlighting a 2018 office of inspector general study of closed charter schools, as well as a new report from a public school advocacy group stating that $1 billion in federal funding has been wasted on charter schools that never opened or were closed due to mismanagement and other reasons. The Trump budget seeks $500 million in federal aid to charters, a $60 million increase from current funding, and Congress has agreed twice under Trump to boost that funding. If there was any value in the Education Subcommittee hearing, it is that all should know without any doubt where the priorities of Republicans are in the area of education. Forget about kids and learning. Forget about being civic-minded and making investments in the community through public education. Instead, profit must be the result. 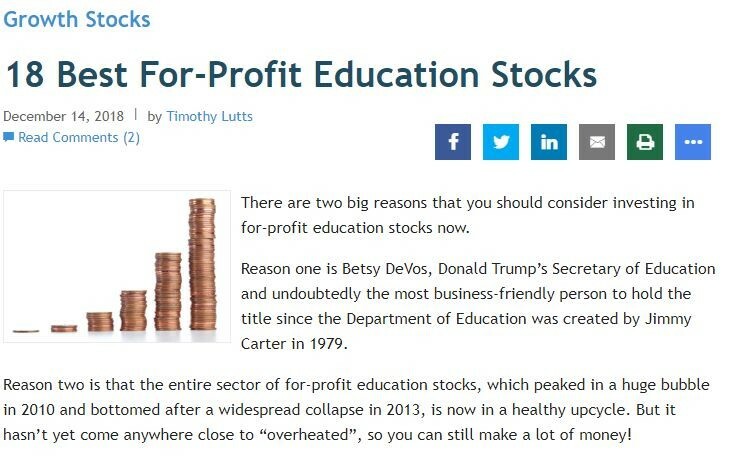 In this model promoted by Republican budget priorities, students come in third behind profit/shareholder value and executive compensation for the for-profit school leaders. In this alternative universe, it’s all about people who look at market activity and portfolios and concern themselves with calculating yield on investment. A December 2018 article in the publication Cabot Wealth revealed the thinking of the finance community when the subject is investment – not in all things public (roads, libraries, public transportation, parks, schools, higher education) – but in those companies that will assist individuals in acquiring wealth. 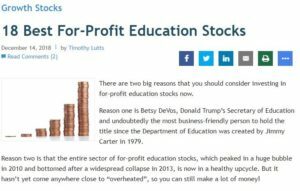 Here is what the first two paragraphs had to say: It’s about Betsy DeVos and the time is right to buy for-profit education stocks. If you had any doubt about who might be expendable during this administration through the actions of Donald Trump, Budget Director Mick Mulvaney, and of course, the notorious Betsy DeVos, it’s not the folks who want more charter schools on the landscape that will allow them to acquire added wealth for themselves. 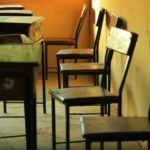 As we await actions that will restore the other proposed recommendations, measures that would lessen support for students with disabilities, those who are supported by afterschool programs, and those who need access to higher education with Pell Grants, think about how this process is driven by ruthless and uncaring administration officials. And while you’re at it, consider the fact that the cost of Special Olympics is offset with just five less trips to Mar-a-Lago in the next few weekends. That headline, published in the aftermath of DeVos’ disastrous congressional appearance, might have forced Trump to reconsider that outrageous and heartless recommendation. As the politcos like to say, that story had such bad optics. Betsy DeVos, like Genghis Khan, can be a destroyer. She can also be another version of Gordon Gekko, who thought that greed is good. In any case, it is time for good people to say enough is too much. We need to offer children, who are our future, a decent and appropriate education, not the edukashun that DeVos and Trump want to offer.